Hiten are essentially celestial beings classified at the highest level of the realms of karmic existence known in Buddhist belief as the Six Paths. 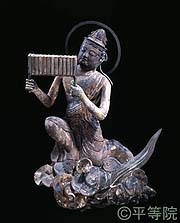 Since celestial beings are able to float in mid-air, in the Buddha realm they soar overhead and scatter flowers, playing musical instruments, burning incense, and otherwise exalting the enlightened beings. 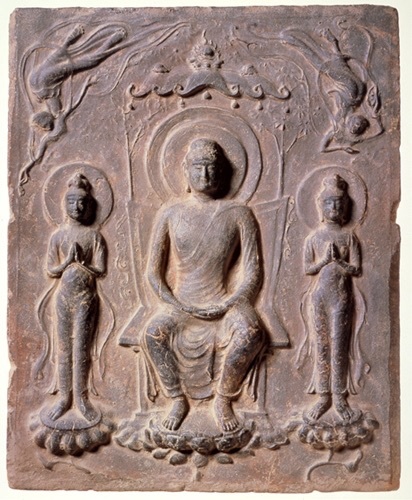 It is in this capacity that images of Hiten have accompanied depictions of Buddhas from the birthplace of Buddhism in India, through Central Asia, to China and its Western Regions. 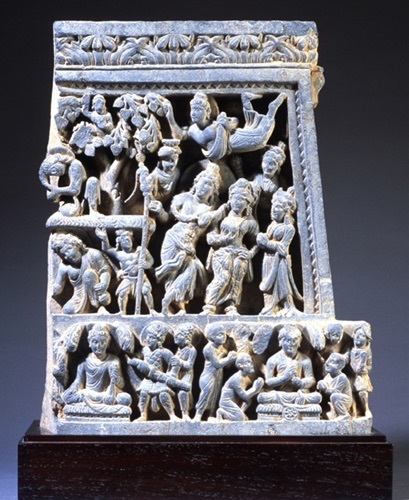 Each place engendered its own particular style of expression: In Gandhara they were influenced by Western Hellenism. In China and its Western Regions they were melded with indigenous traditions and magnificently adorned the walls of temple grottoes. Thus, Hiten advanced on a grand, continental scale along the axis of the Silk Road, eventually making their way to Japan, even while retaining components from distant Europe. This section traces one segment of the development of the Hiten form through a small but revealing selection of examples from regions from India to China. Upon reaching Japan, they exhibit a diversity of forms that reflects this evolutionary path. Of these, the former wall paintings from the Horyu-ji Main Hall inner sanctuary (No. 21) and the East Pagoda finial from Yakushi-ji (No. 25) are celebrated as classic examples illustrating what one might imagine to be the prototypical form of Hiten. The Buddhist sutras recount that not only Hiten, but also figures such as sacred Karyubinga and Gumyochobirds also dance in his honor, while the trees and earth of the Paradise glitter with the Seven Treasures. These are just some of the many ways that the wondrousness of the Buddha realm is expounded. Scenes of this heavenly world are illustrated in Pure Land paintings, through which it is possible to see in concrete form the ideal paradise to which the people of the times aspired. 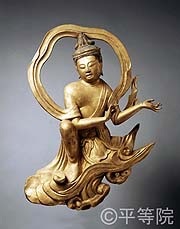 At the same time, sculptural images of Hiten, dancing bodhisattvas and other figures, jeweled canopies, glowing nimbuses, and the various decorative ornaments adorning the icons were not only fitting accoutrements for the Buddha; they also served as three-dimensional expressions of the Pure Land in our own world. This section examines the landscape of the Pure Land world, starting with painted depictions of the Western Paradise and continuing with examples of groupings of bodhisattvas, Karyobinga and Gumyocho birds, and other beings that worshipped the Buddha with the Hiten. 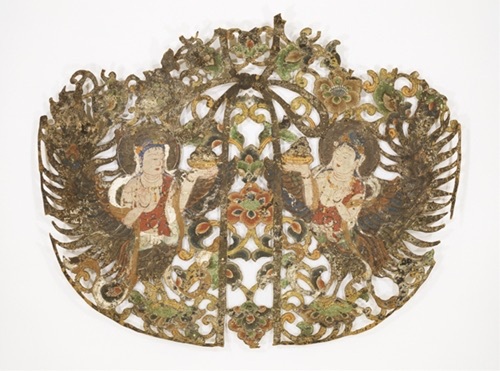 The Hiten-covered nimbuses and pataka banners, keman ornaments, and other sacred adornments can further be seen as a means of expressing and recreating the scenery of the Pure Land in the present world. Through works such as the banner cap(No. 53), keman sanctuary ornament (No. 54) that are said to have decorated the Konjikido Golden Hall of Chuson-ji, the resplendent heavenly world idealized by the people of the time, will surely take shape before your very eyes.